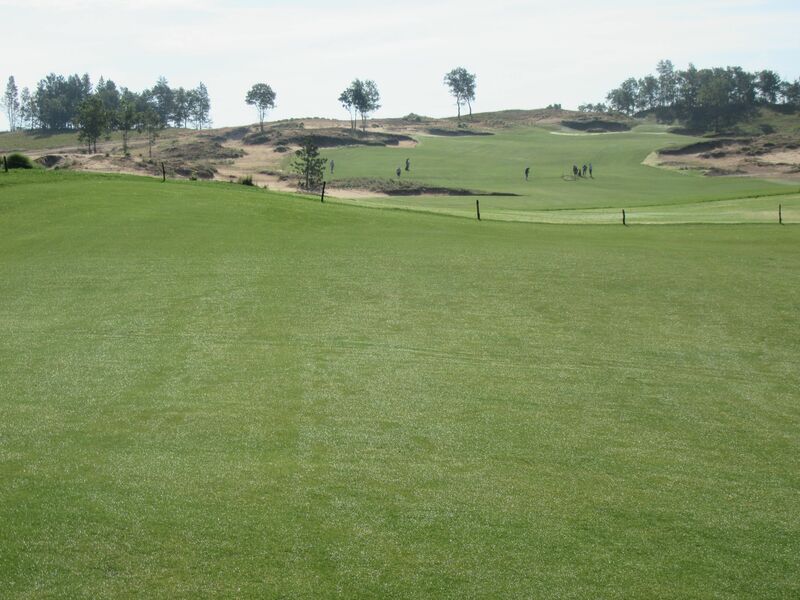 The back nine starts out in wonderful fashion, just right of the tee boxes from the first hole and also playing downhill from The Volcano. 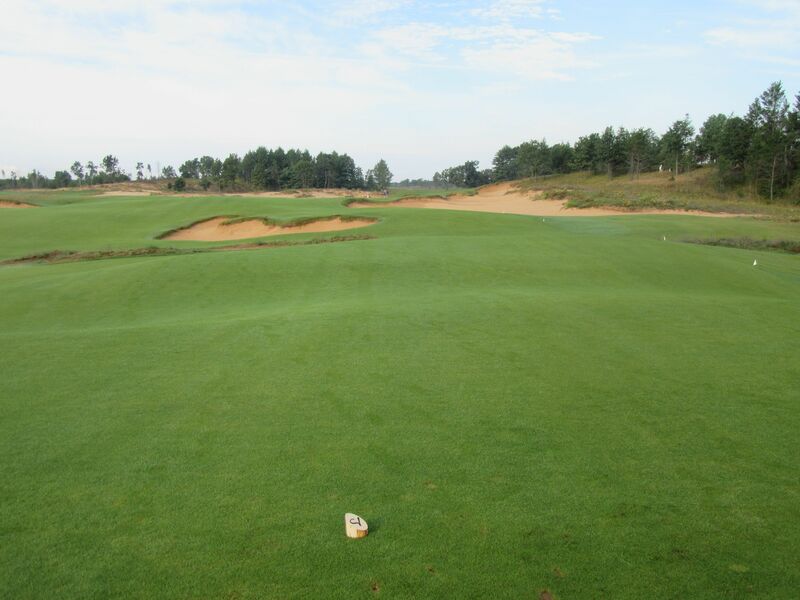 A par five of 563 yards from the tips, it is much more manageable from the first and second tees in. 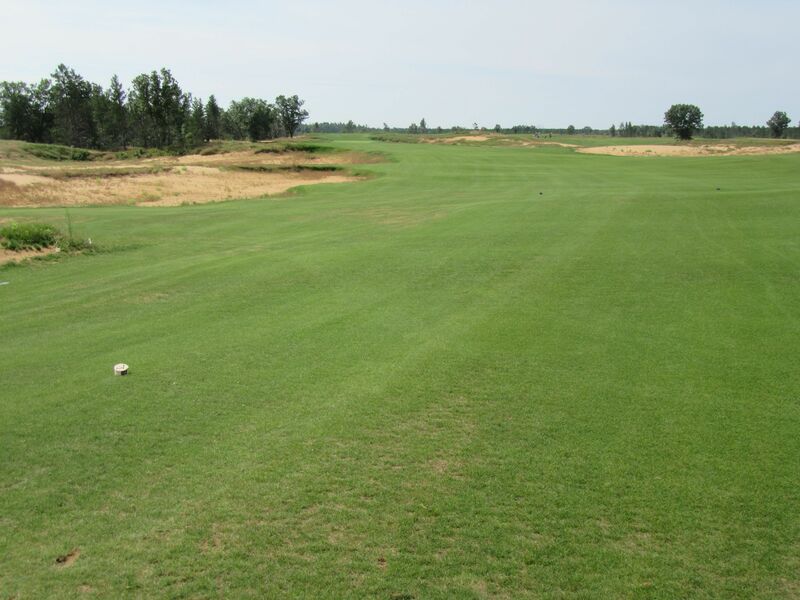 The tee shot on ten just needs to avoid the central fairway traps, making the right side quite attractive. 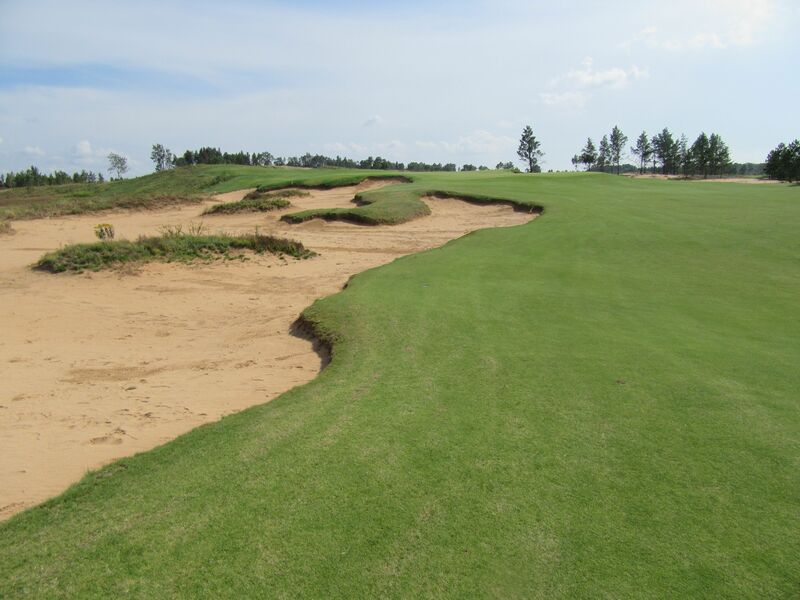 A massive sand and waste area protrudes short-right of the green, though, and is the biggest hazard to stay away from on ten. 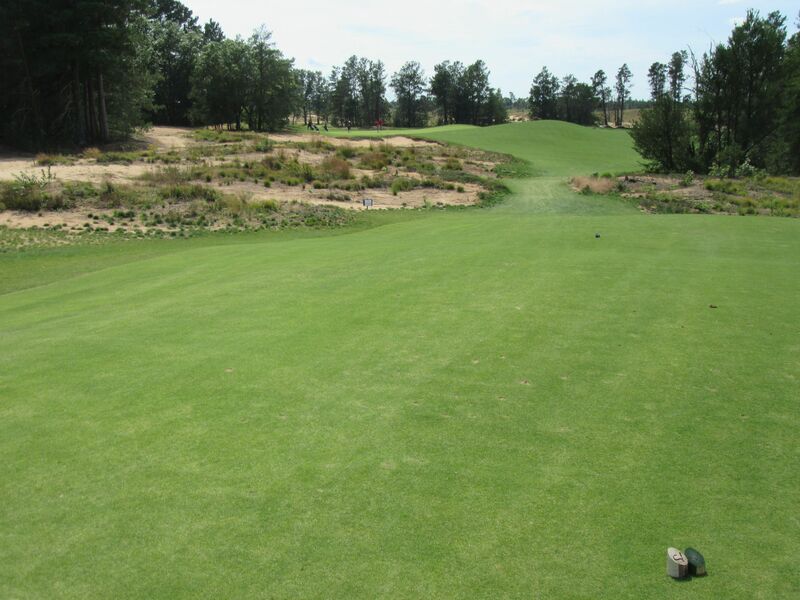 The par 4 eleventh bends right to left and plays much shorter than it looks from the teeing areas. 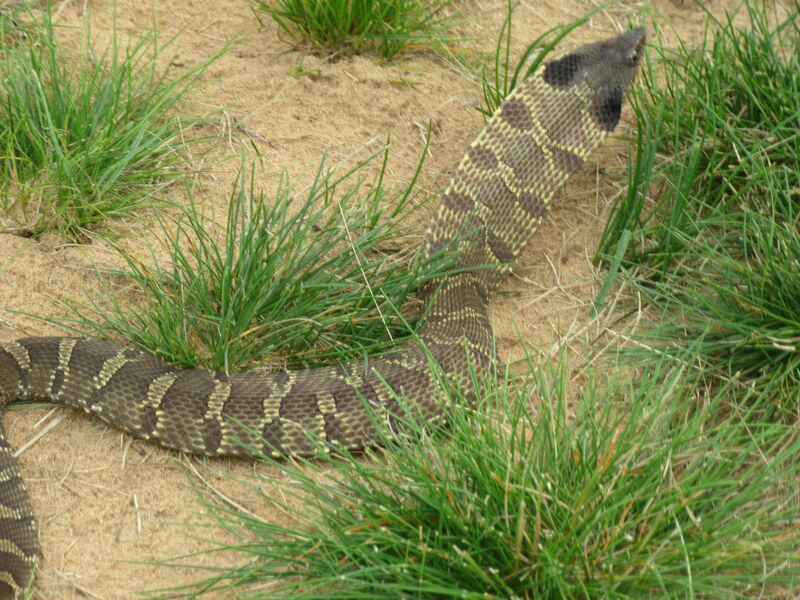 A false front needs to be carried. 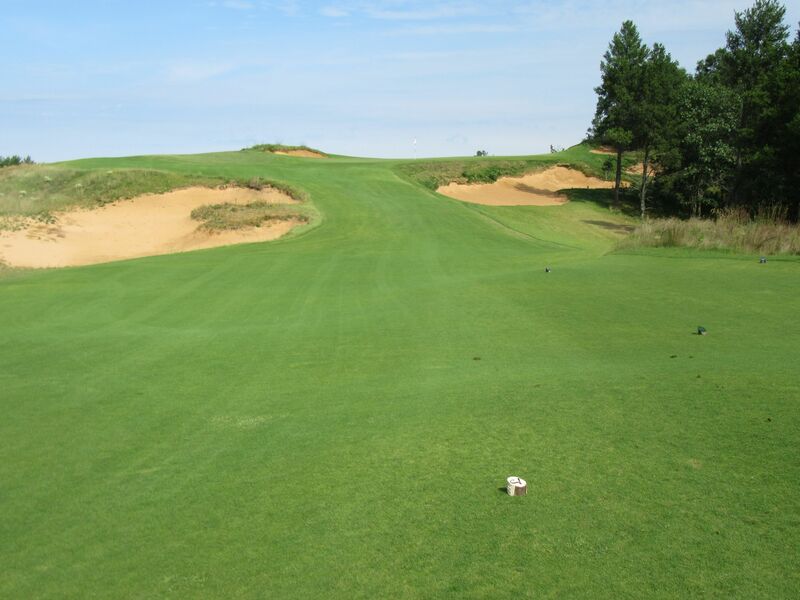 The par 5 twelfth might be my favorite hole on the entire course: A mid-length par five with split fairways to the left and right, this hole brings in a multitude of options off the tee. 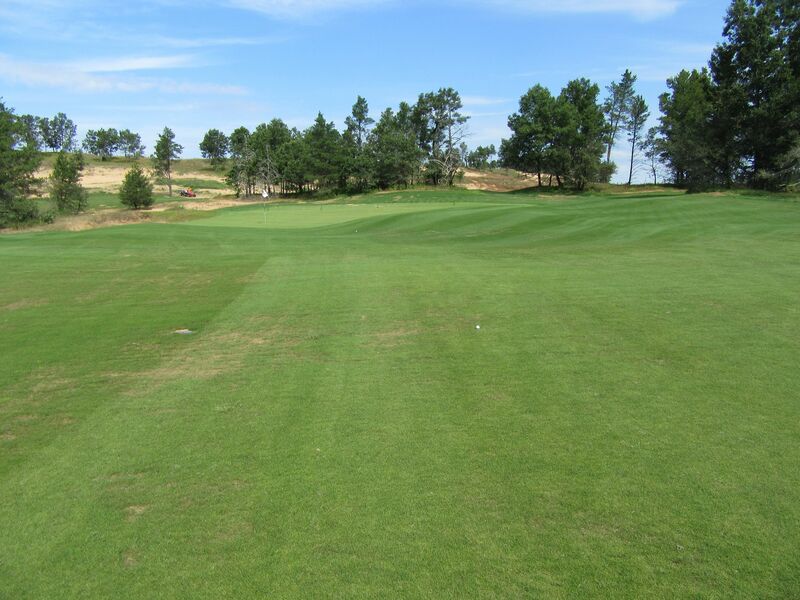 The fairway left of the trees is narrower but allows for an elevated look at the green on the second shot. 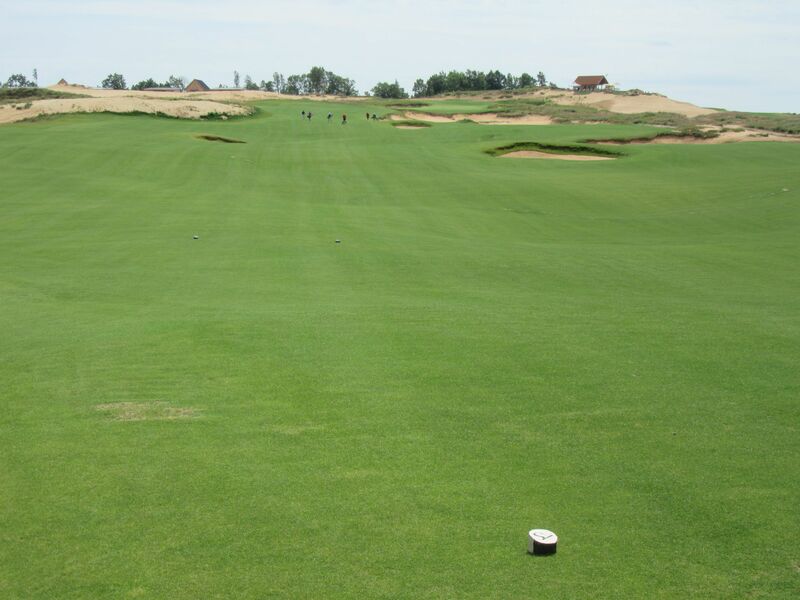 The fairway right plays much further uphill, but allows for a greater margin of error. 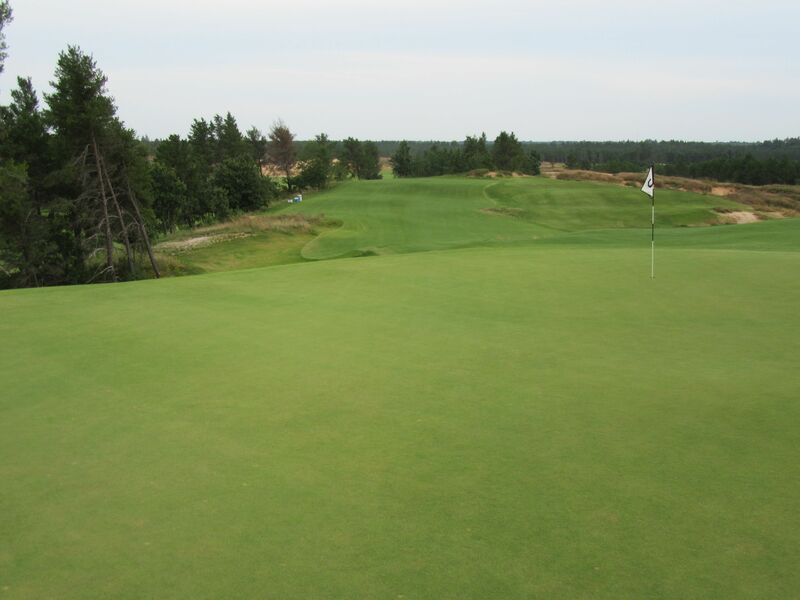 The green on twelve is elevated and massive, so take enough club to land on the putting surface. 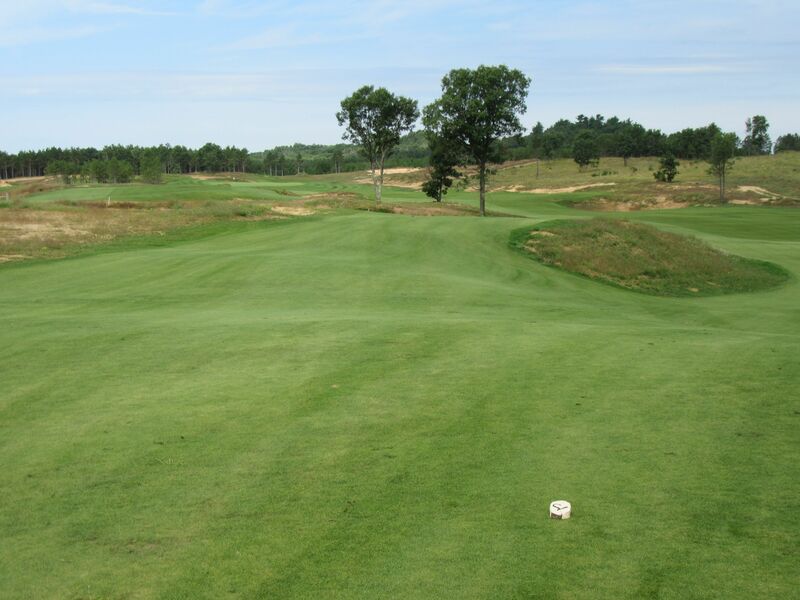 The fourteenth is a classic Coore/Crenshaw par three, downhill with a false front and waste areas surrounding the left and right sides. 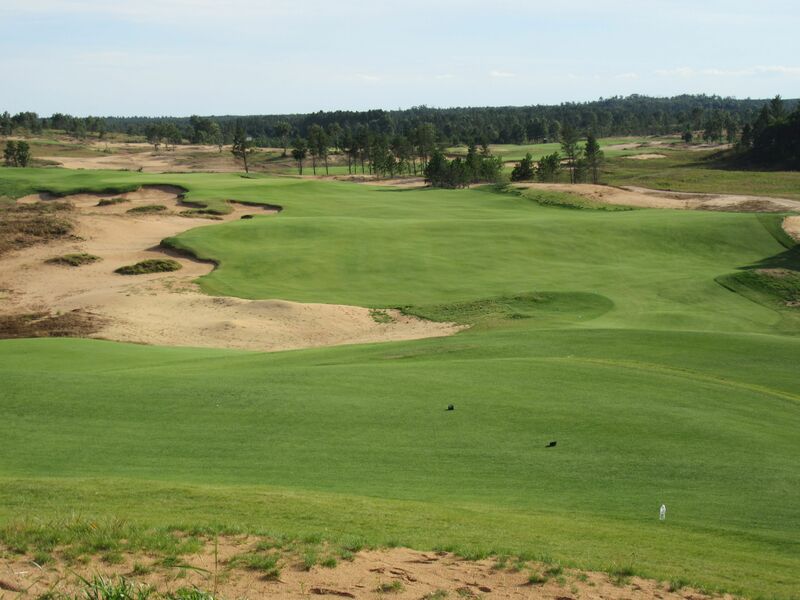 The fourteenth hole at Sand Valley reminded me a little of the eighth at another of the duo’s recent designs, the Red Course at Streamsong in Florida. 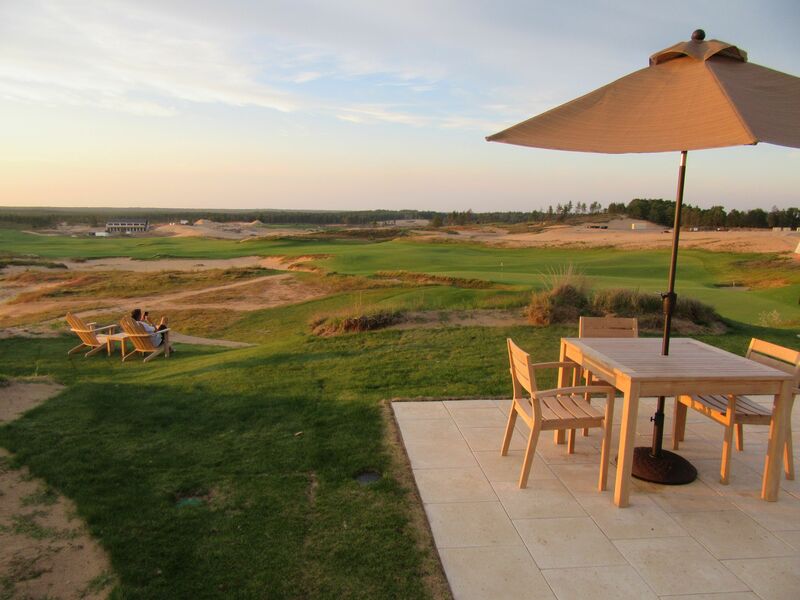 Ahhh, great memories of another world-class golf resort I love! 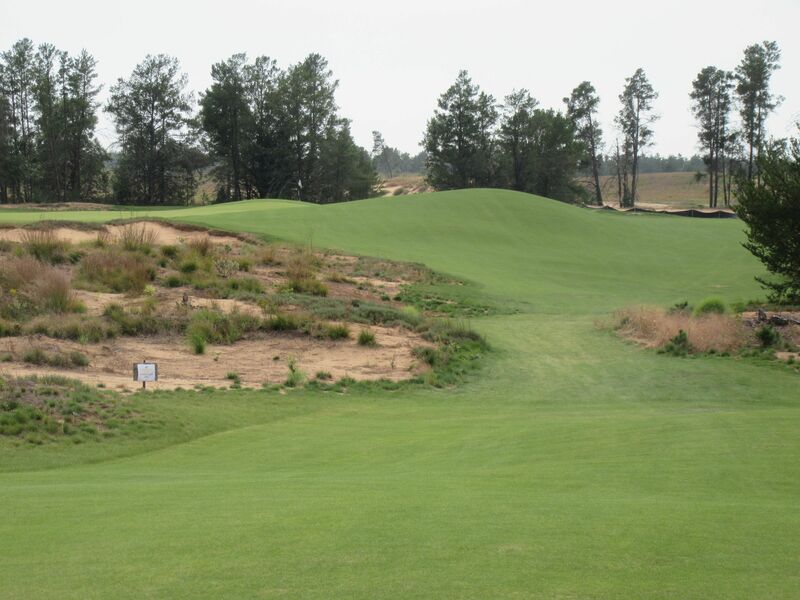 The fifteenth tees off over wasteland to a par four fairway that runs from right to left, and had a really tricky front pin placement. 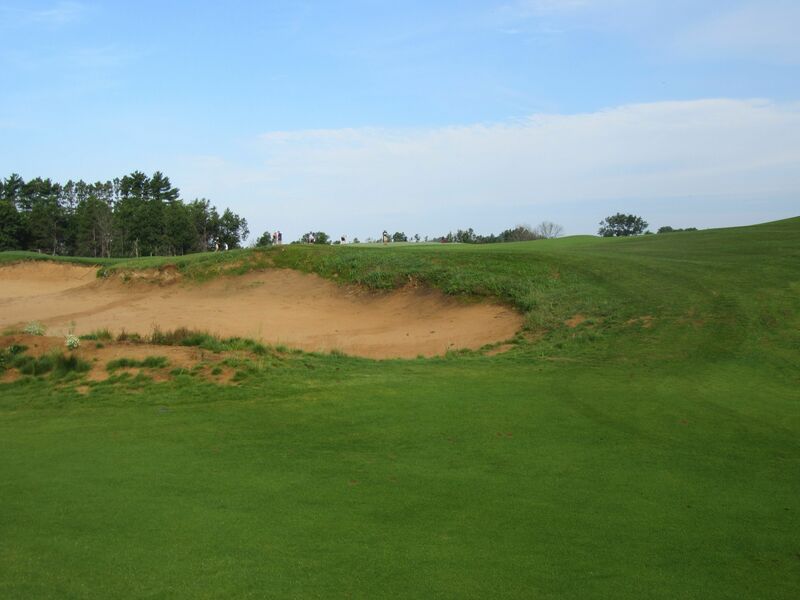 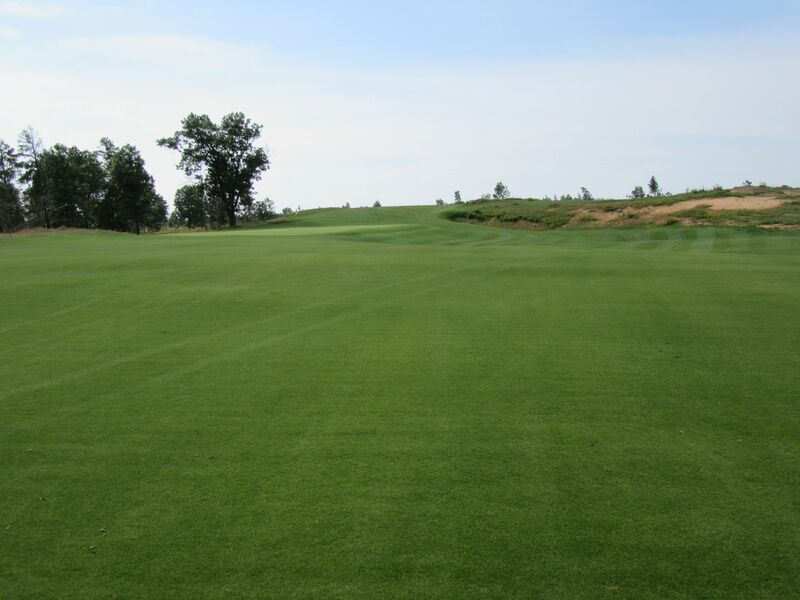 The entrance of the green has several mounds that have to be carried and will not allow for shots to be run on, which is opposite the majority of the course which pleads for low shots that stay out of the wind and use the fast and firm playing surfaces to advance the ball. 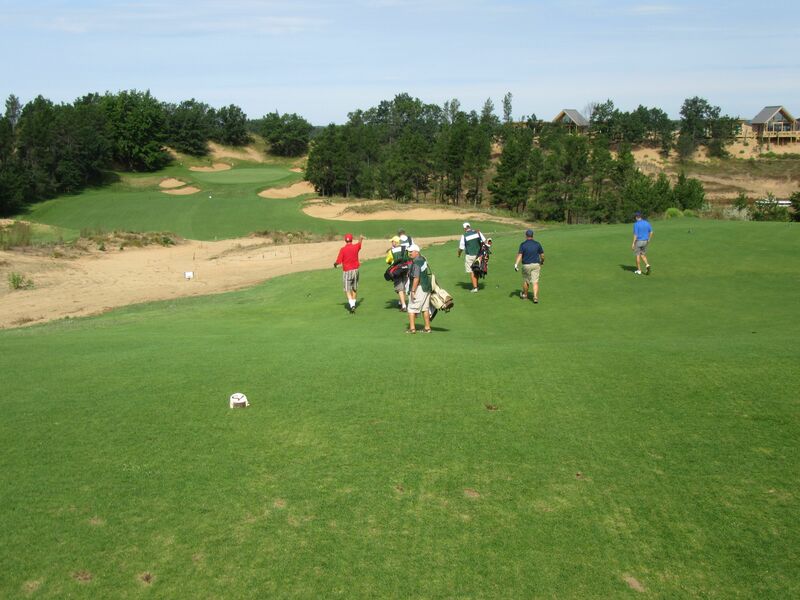 The sixteenth tees off left of the tenth hole green, and is a sharp dogleg left and heavily mounded on the left side. 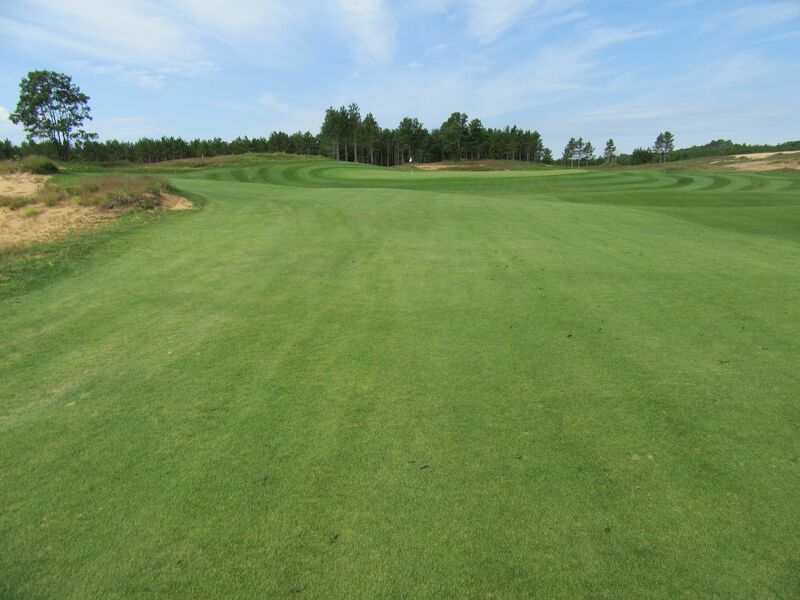 Find the fairway off the tee and have an uphill mid-iron in to a green that is heavily guarded by fall-offs on all sides and a deep trap front-middle. 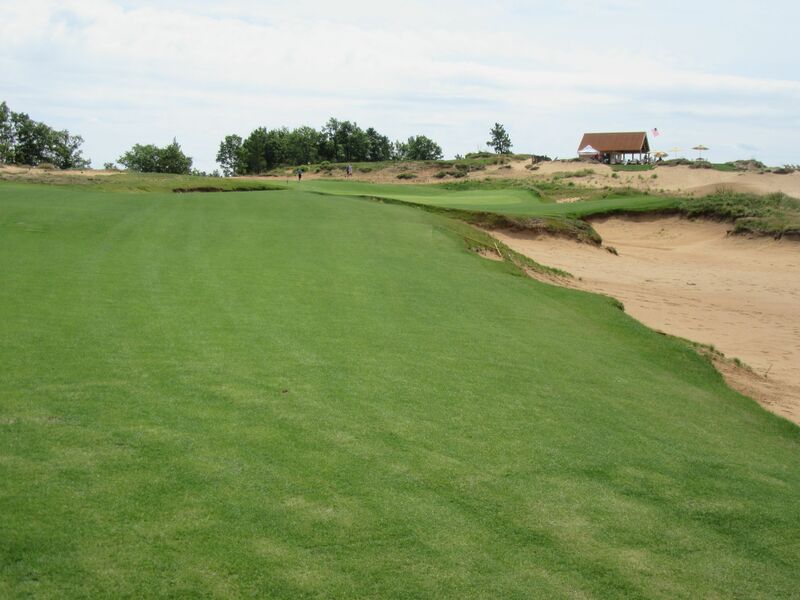 On a course with spectacular par threes, the 17th might be the most interesting. 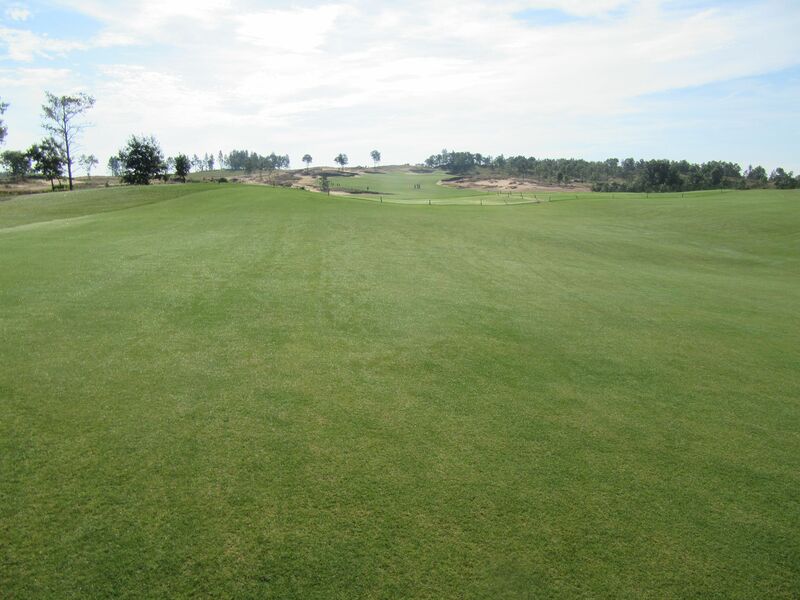 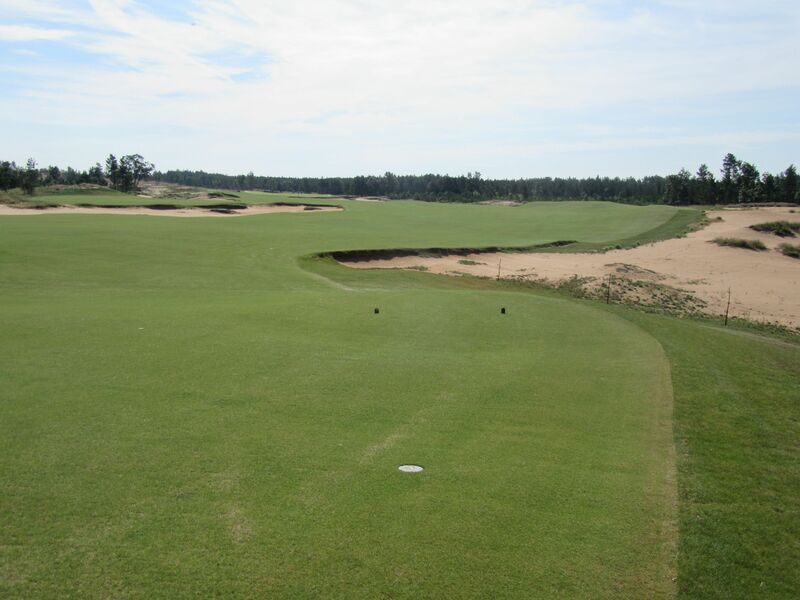 The hole plays slightly uphill and looks extraordinarily long on the scorecard – 236 yards from the tips! 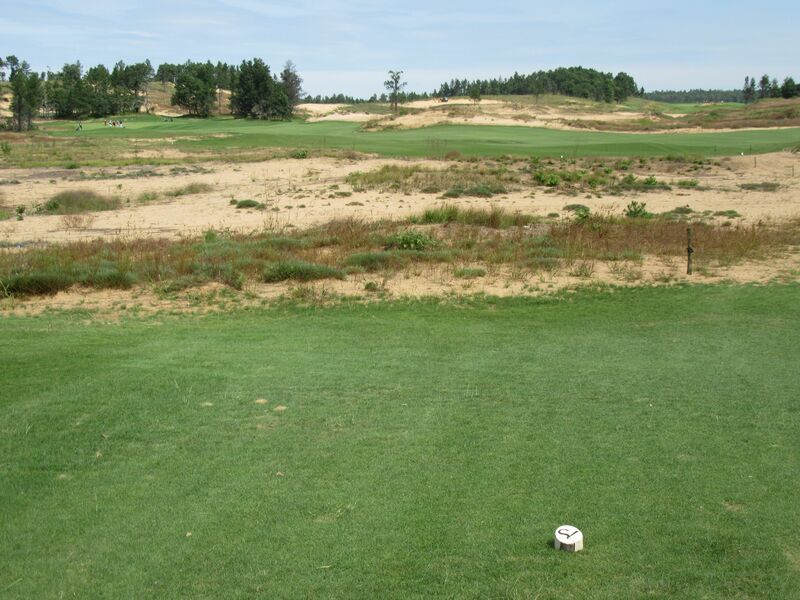 – but plays quite generously. 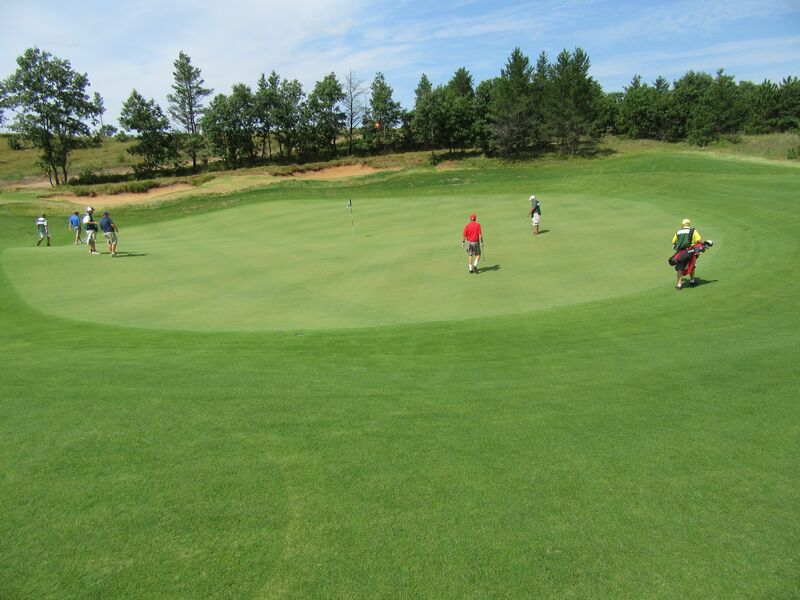 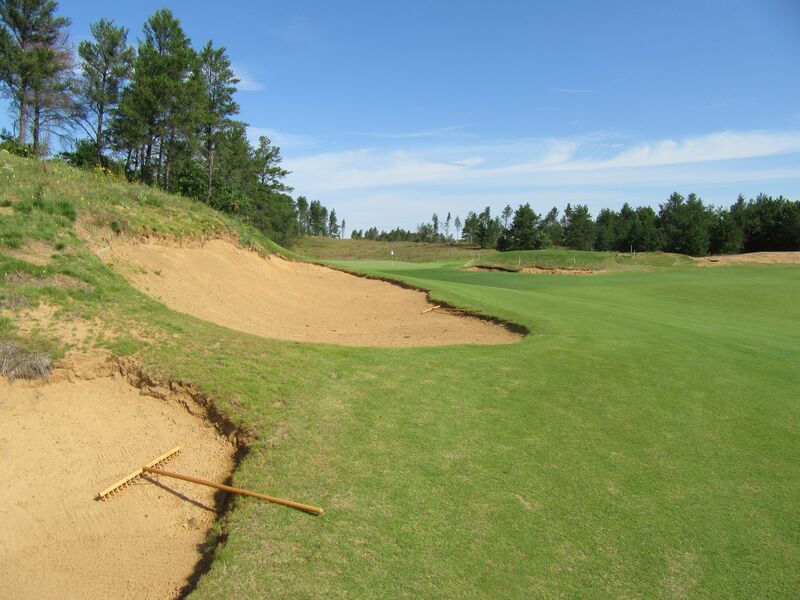 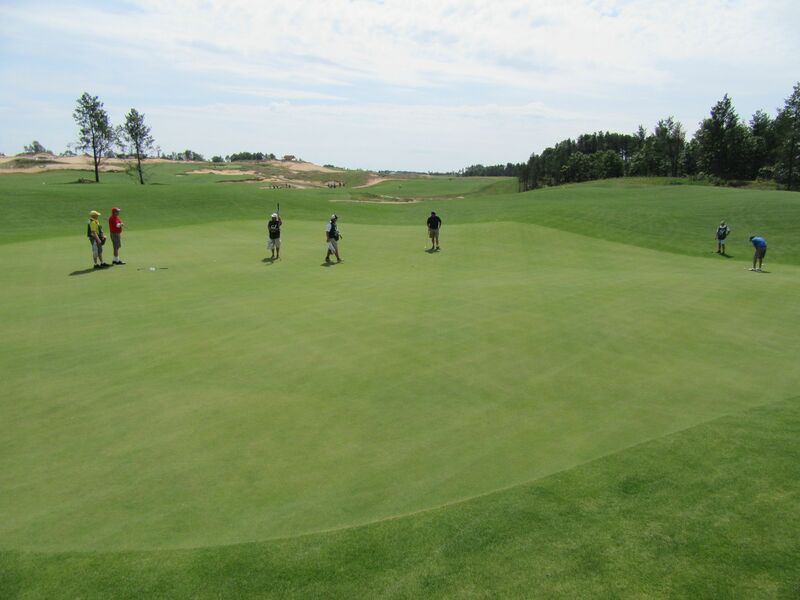 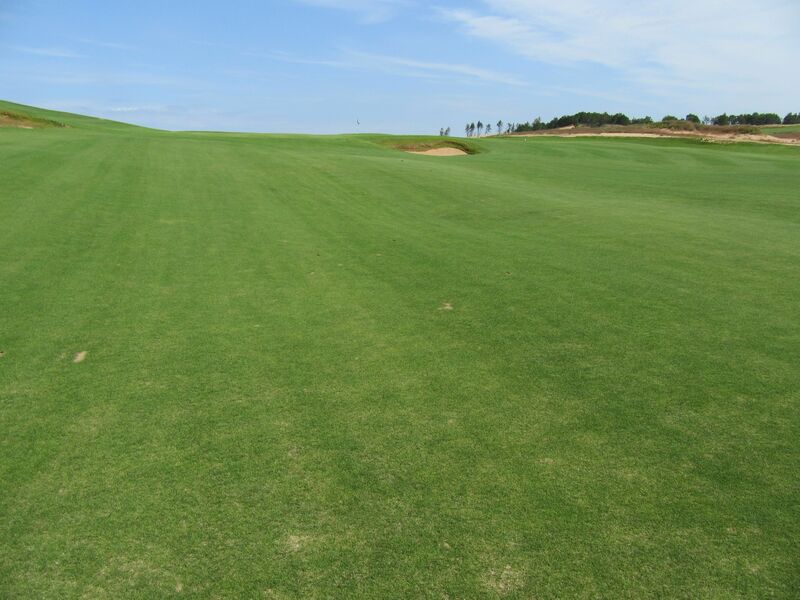 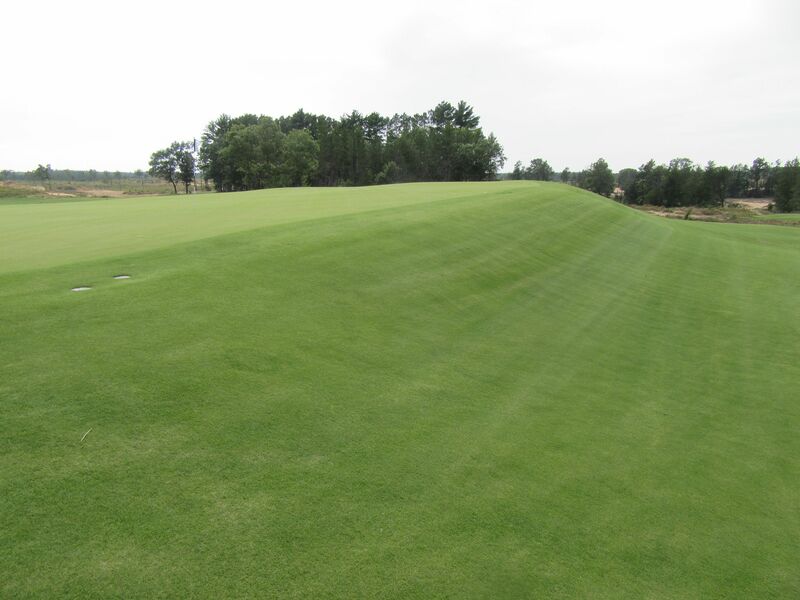 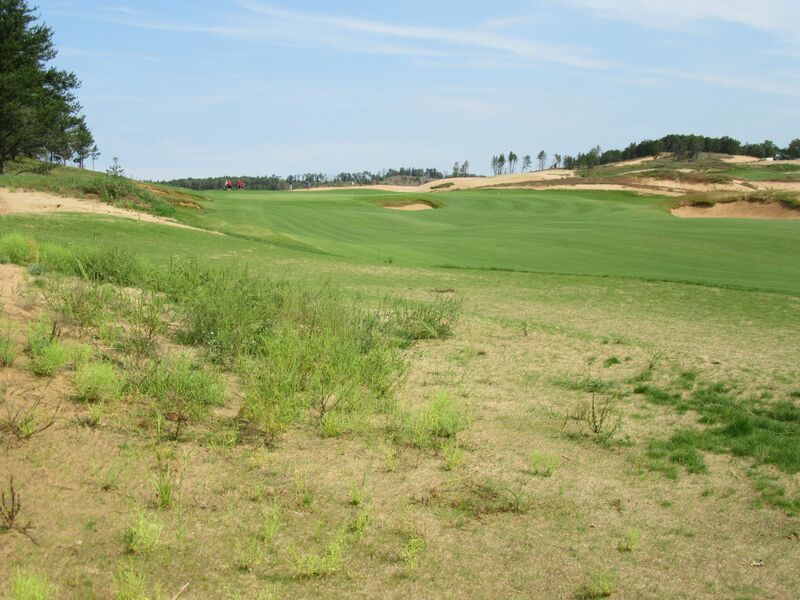 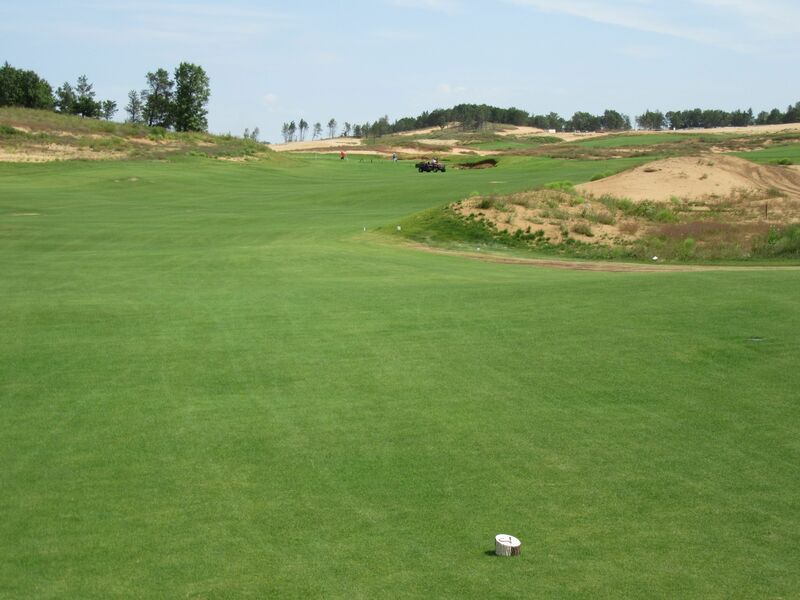 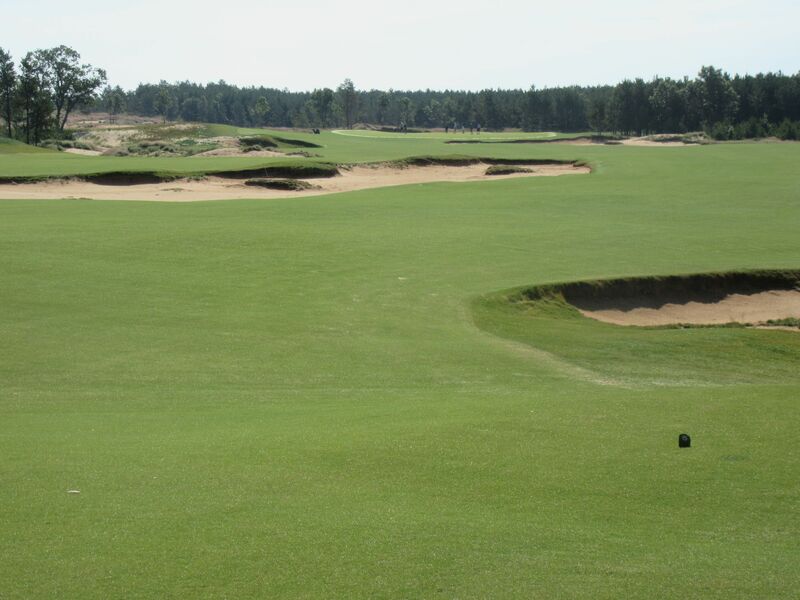 With a massive punch bowl green, anything within 30 or so yards left or right of the green will funnel down the mounded outer banks and should find a piece of the putting surface. 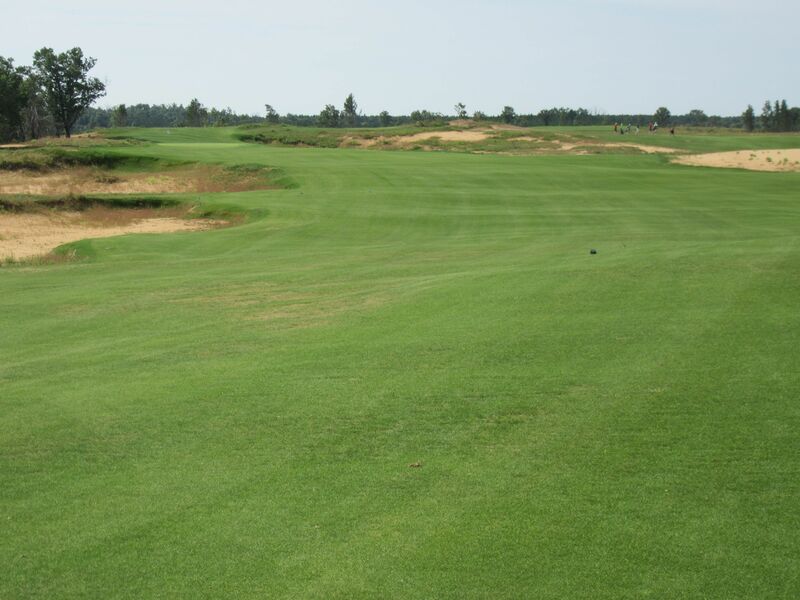 Eighteen is a tremendous, and challenging, par five finishing hole. 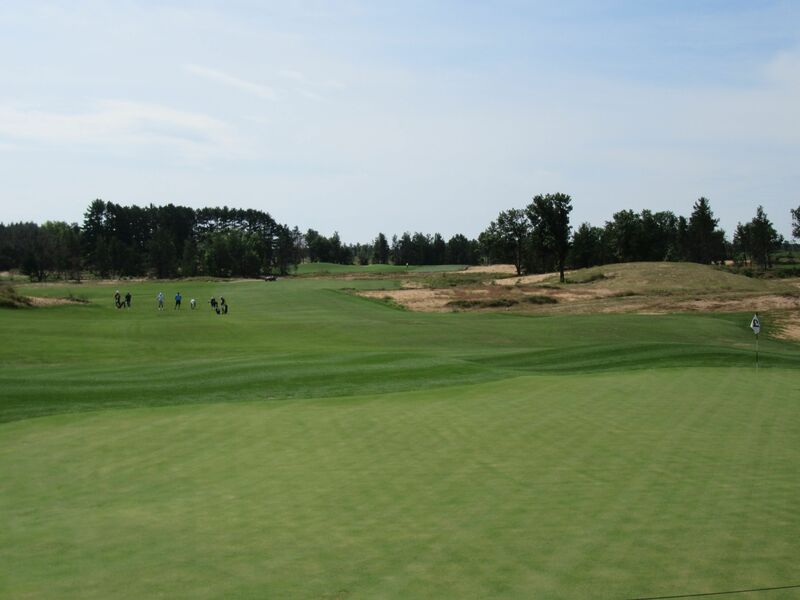 Like the majority of the course, there is plenty of room off the tee (save for a few fairway traps to stay away from), but things get really interesting on the second and third shots! 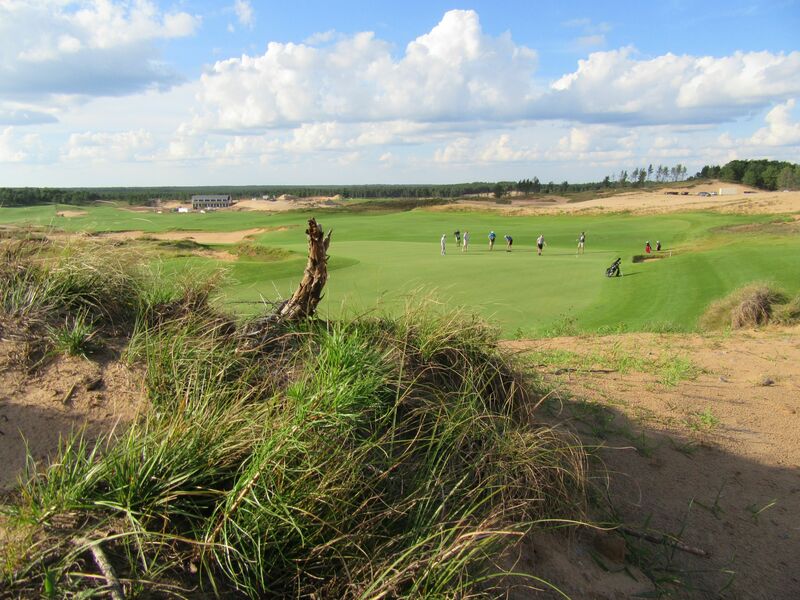 A tall sand dune creeps in to the fairway down the left side, making tee shots toward that side of the fairway blind over the dunes. 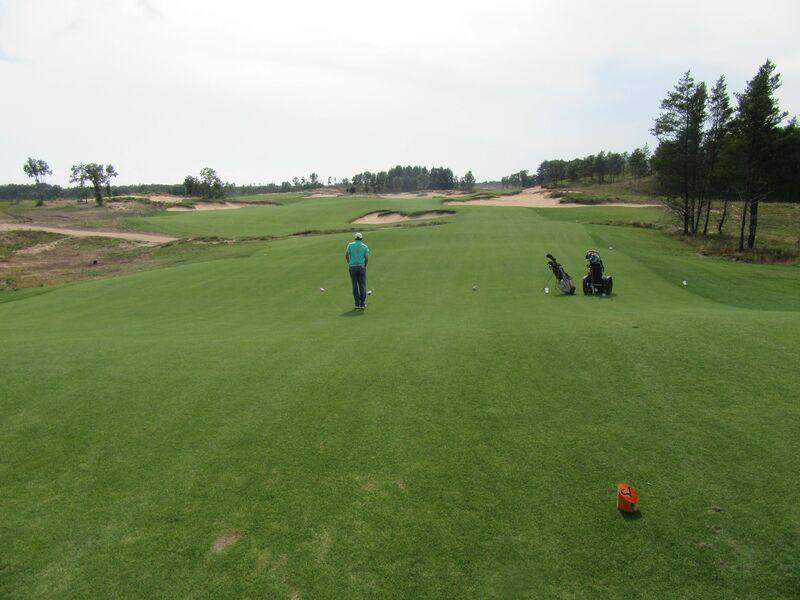 This shot gave me fits during our round – I had a general idea of what the fairway did, but had no idea how wide it was and out-thought myself in to a terrible mid-iron that found the sprawling waste area that runs most of the right side of the fairway up to the green. 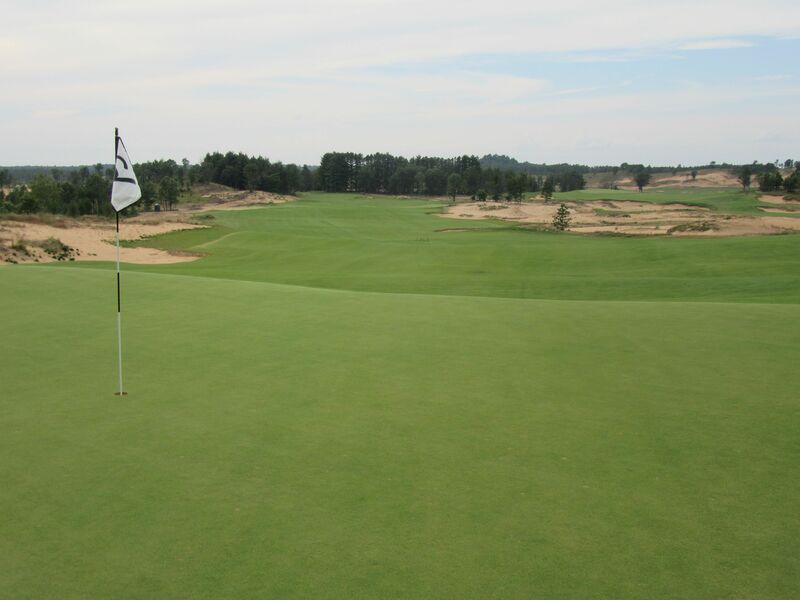 A long, long green from back-to-front, the eighteenth has great versatility with potential hole locations that can adjust the finishing hole’s length by 40 or 50 yards. 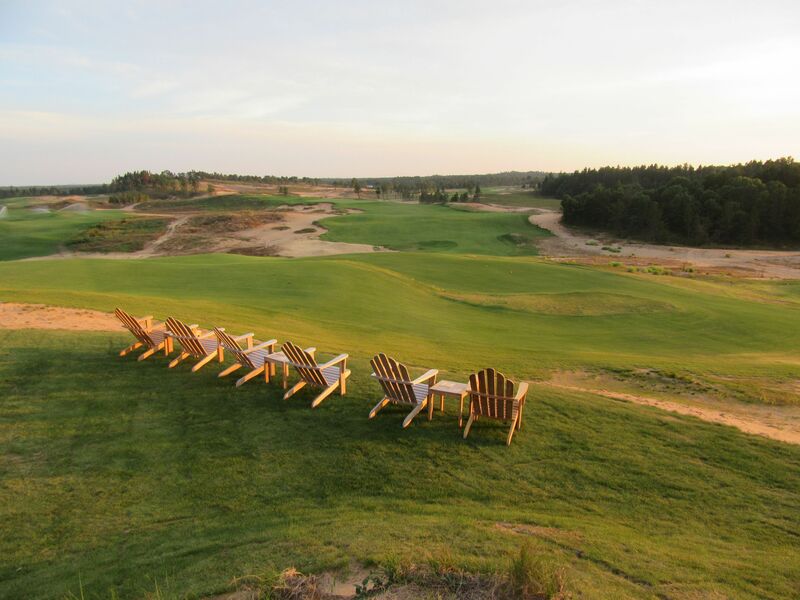 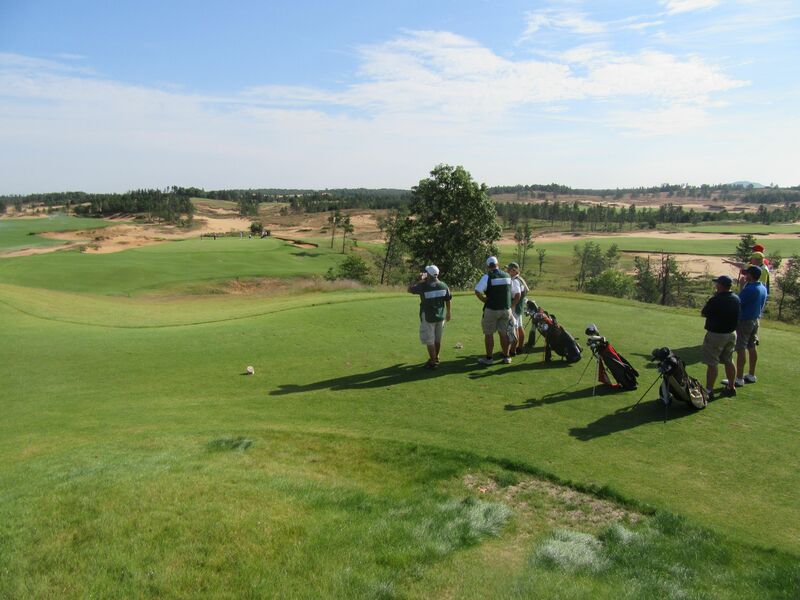 Sand Valley is the hottest golf development in the world today, and for great reason: Mike Keiser is a golf visionary working with the preeminent design teams in the world. 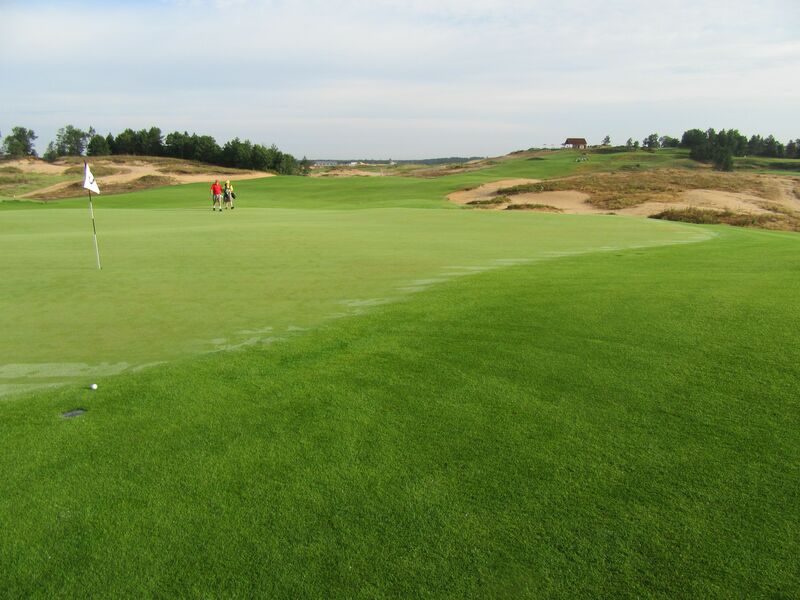 Everything he touches turns to gold. 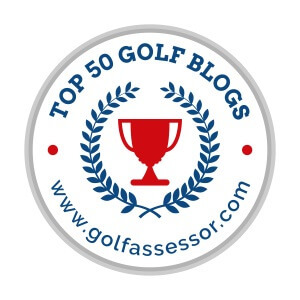 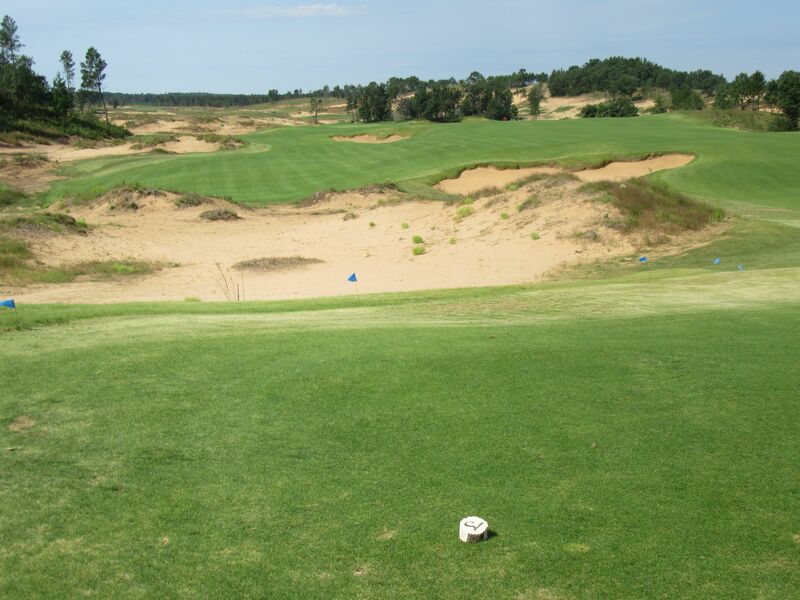 The terrain is dramatic, and Coore/Crenshaw’s design is challenging yet comfortably playable for the “Consumer golfer” that Keiser targets with his developments. 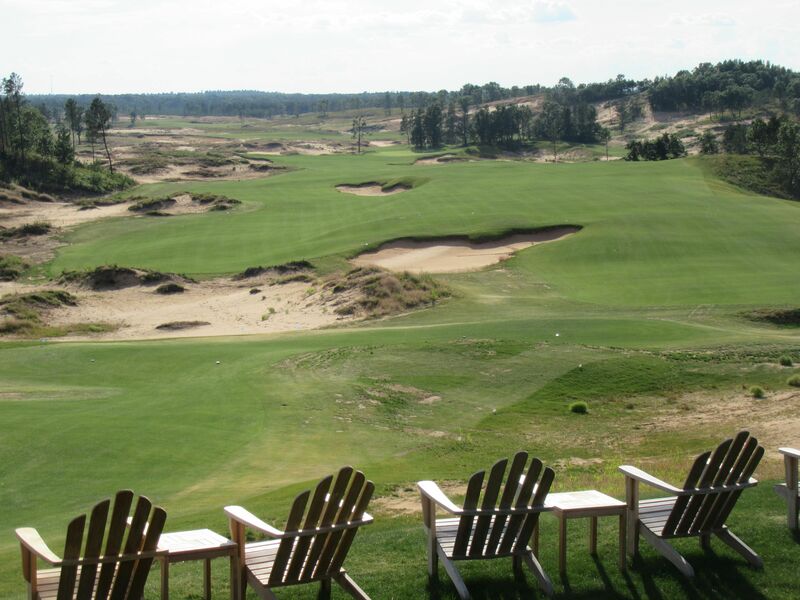 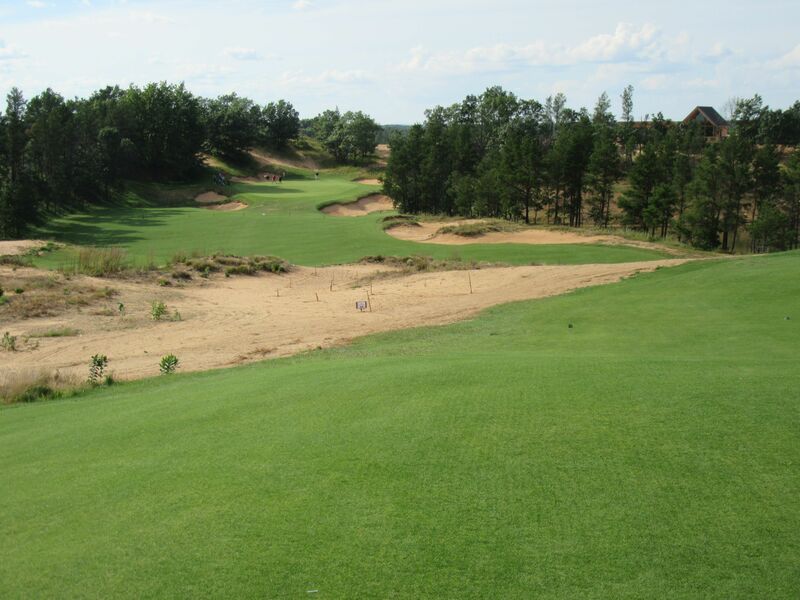 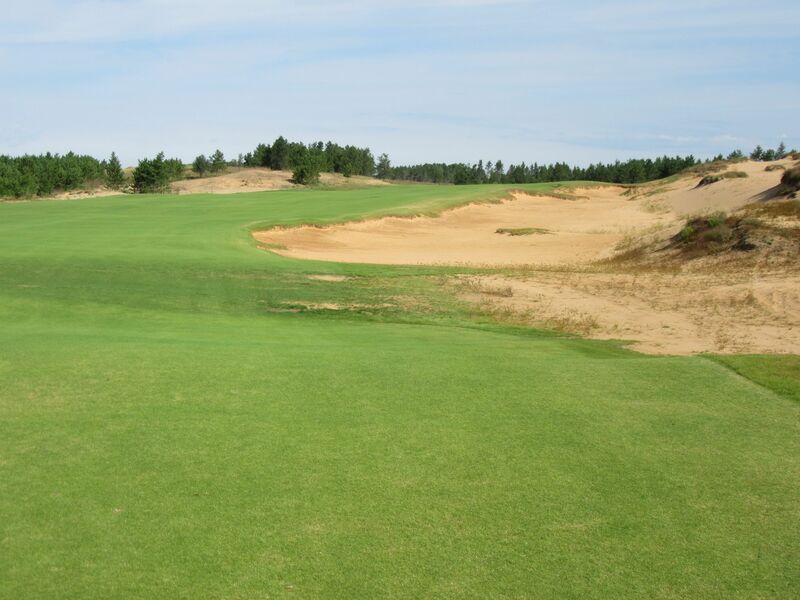 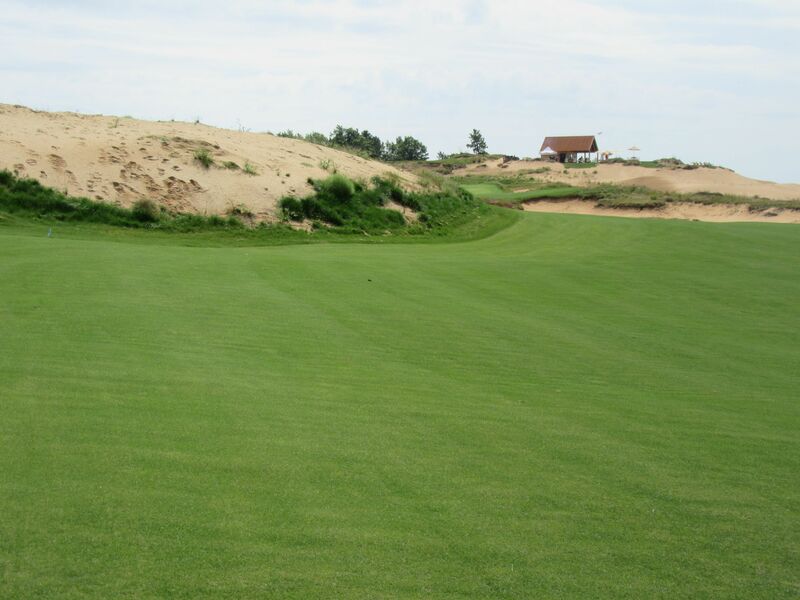 With all 18 holes of the Coore/Crenshaw course open for preview play as of September 1, 2016, I have been hearing from a number of friends who have also made their initial pilgrimage to Sand Valley and have had the same first impressions as me: It’s an instant classic. 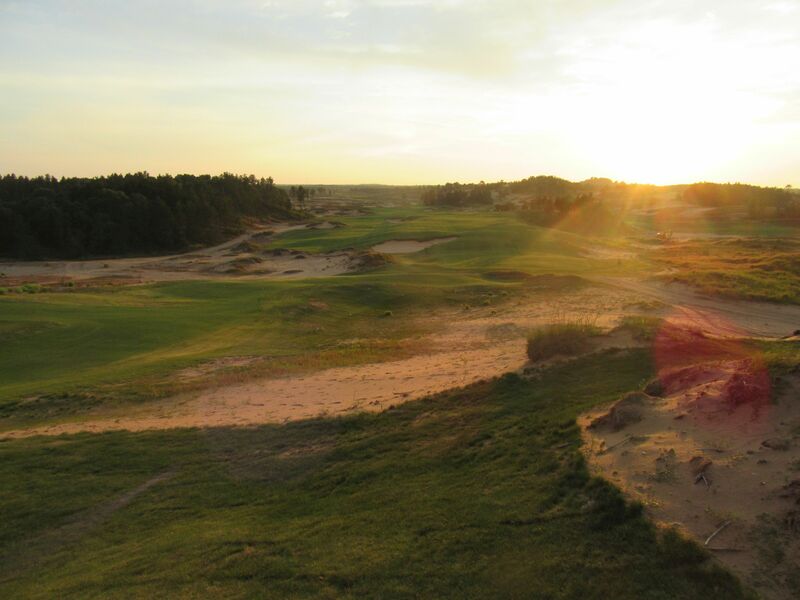 A 2-1/2 hour commute from the greater Milwaukee area, Sand Valley is not the easiest drive but is well worth the time and effort. 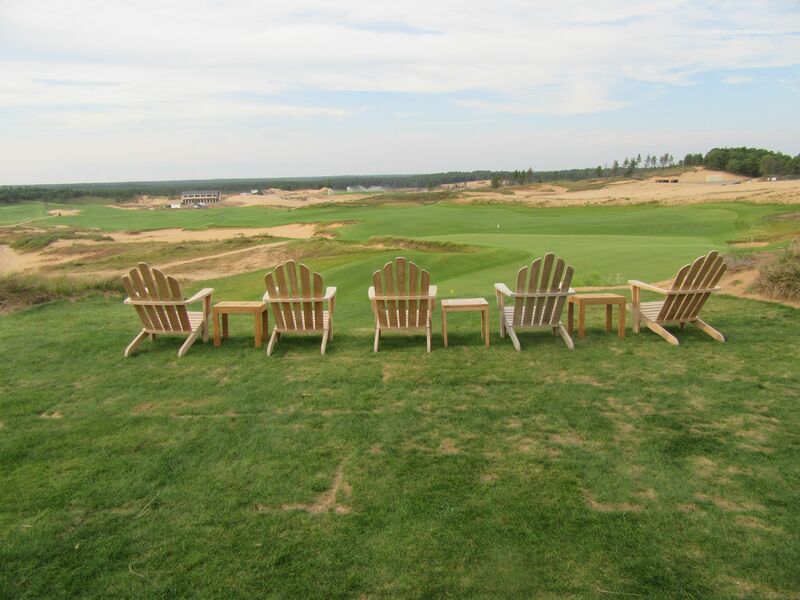 Plan on spending the day, and if you’re up for a wonderful stay-and-play experience then stay on-site in the well-appointed Lake Leopold Cottages. 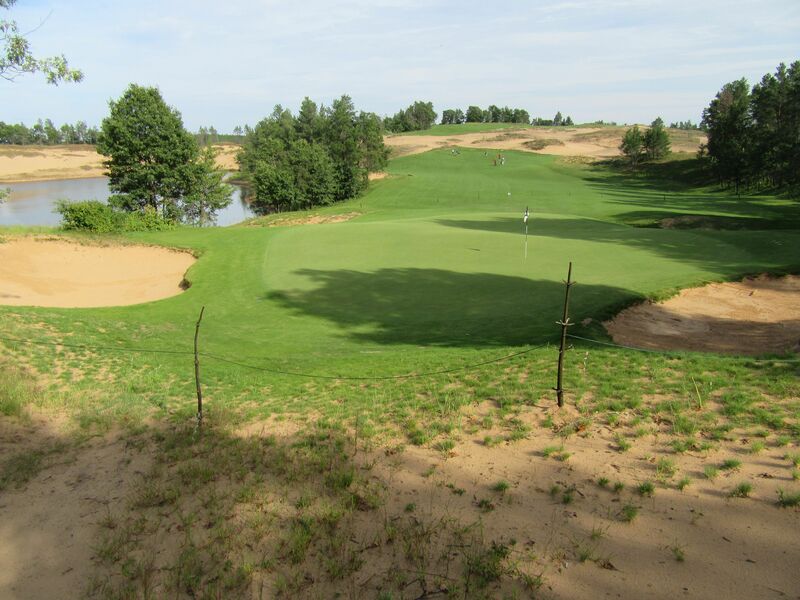 Make sure to map out your trip to and from Sand Valley ahead of time, and don’t just follow your GPS like I did on my way home. 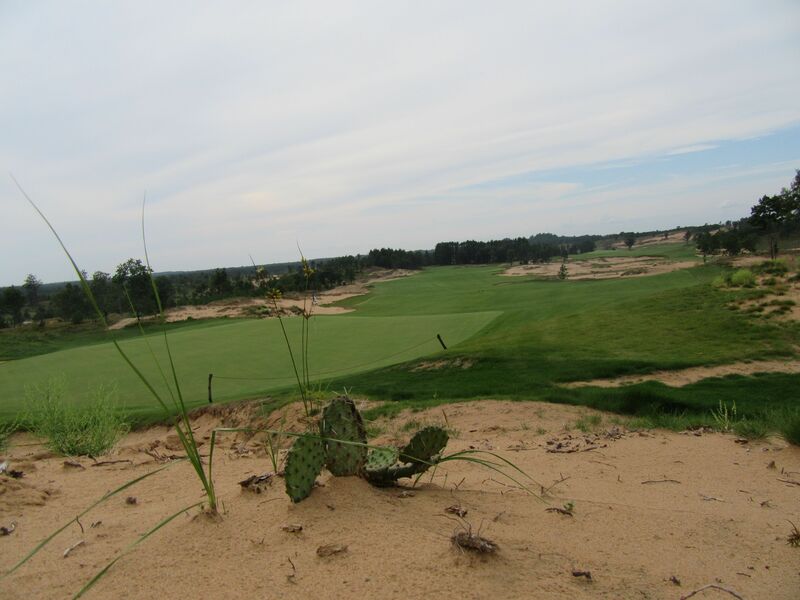 A two and a half hour trip home took three and a half, veering constantly from one one-lane back road to the next, and spending mile after mile on unpaved sand ATV trails and then gravel roads. 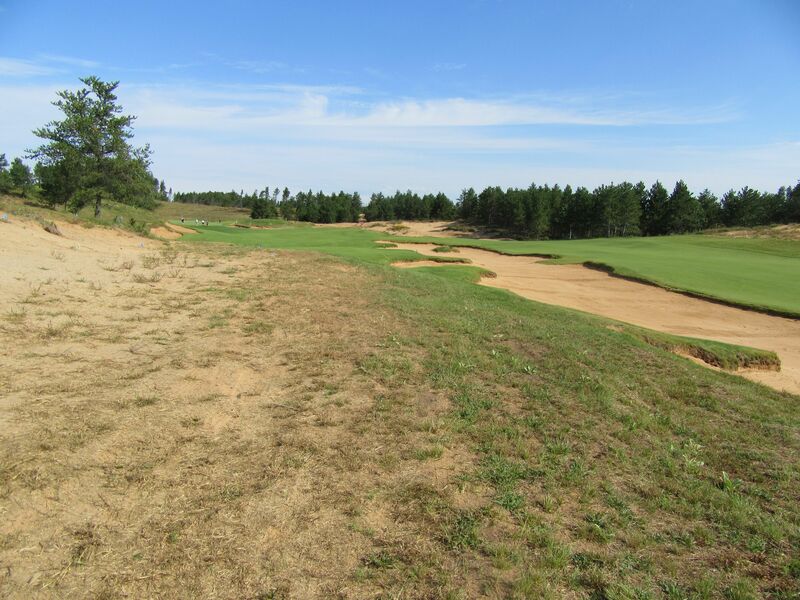 The sand roads had my car slipping all over – there’s no way I’ll trust my GPS and deviate from the “Normal route” next time. 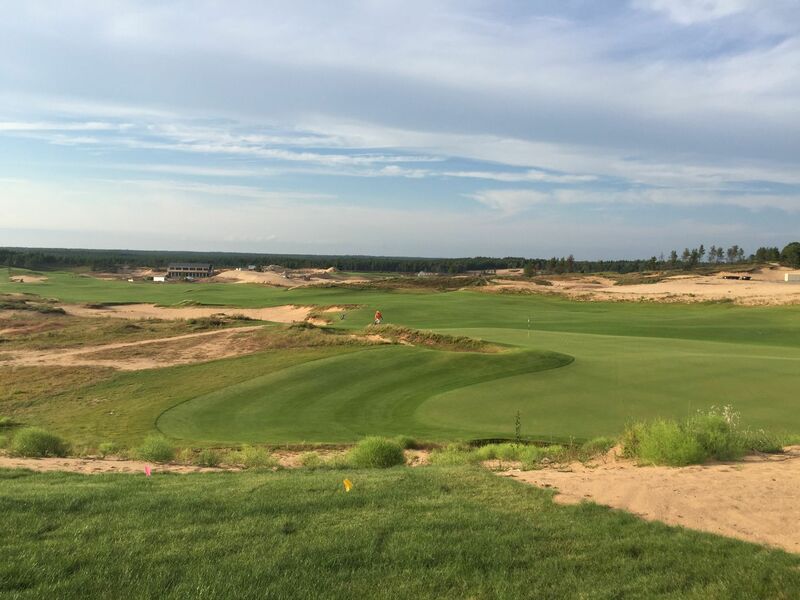 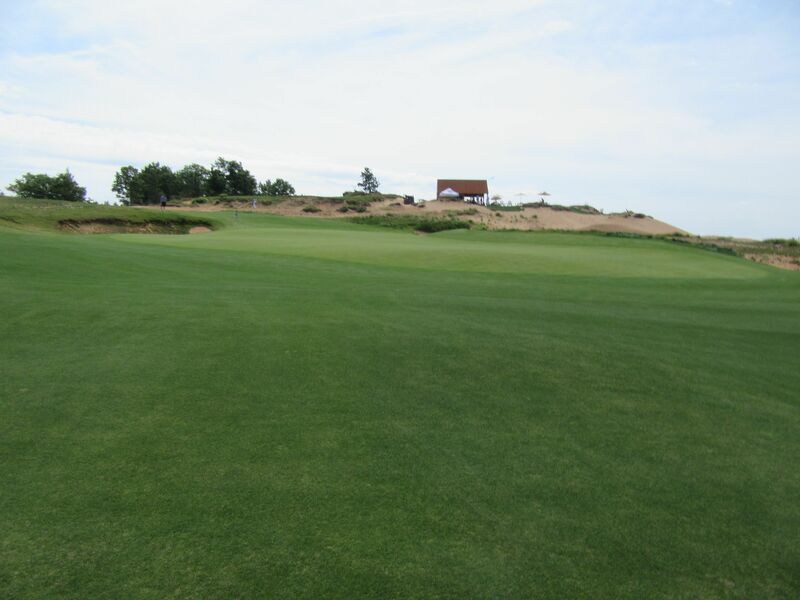 Other developments are already underway at Sand Valley, including the David McLay Kidd course (the land can handle as many as seven championship golf courses), hotel lodging with food and beverage options, and the pro shops. 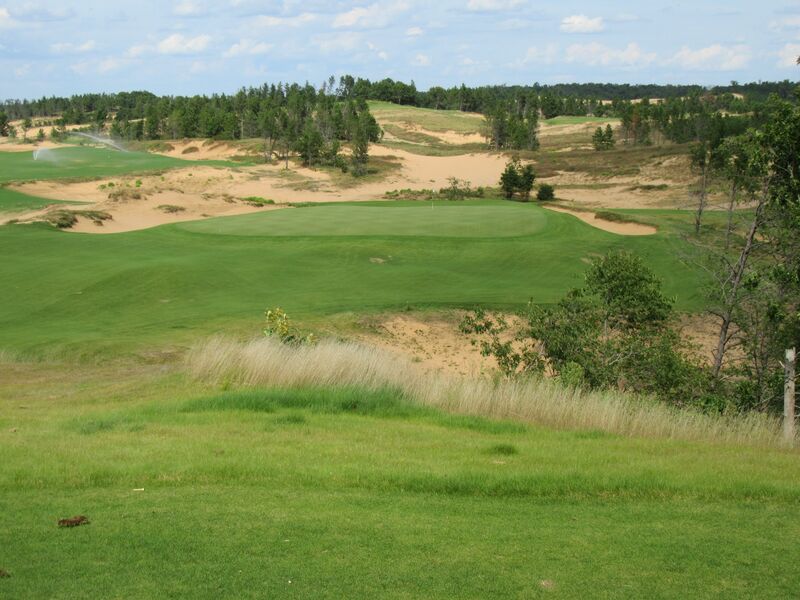 Consider this review a continuation of the last one, and certainly there will be plenty of additional posts to come as Sand Valley continues to grow and develop. 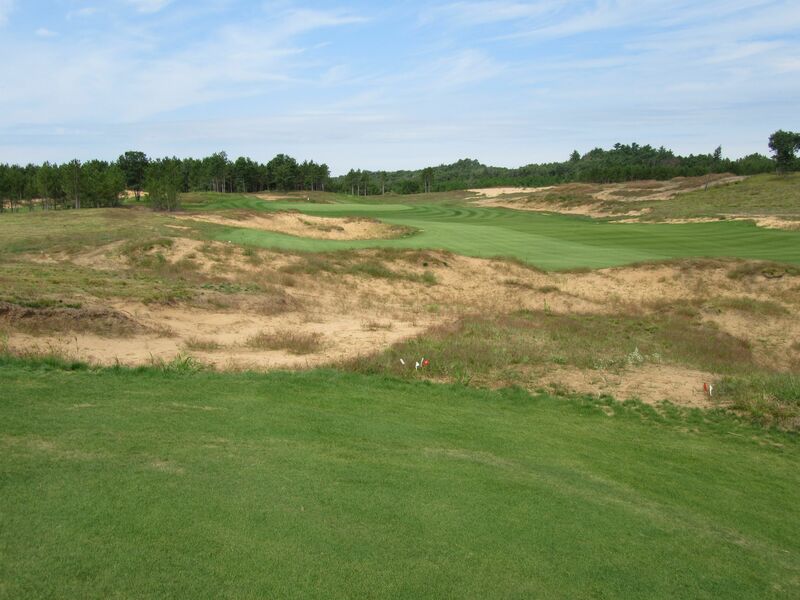 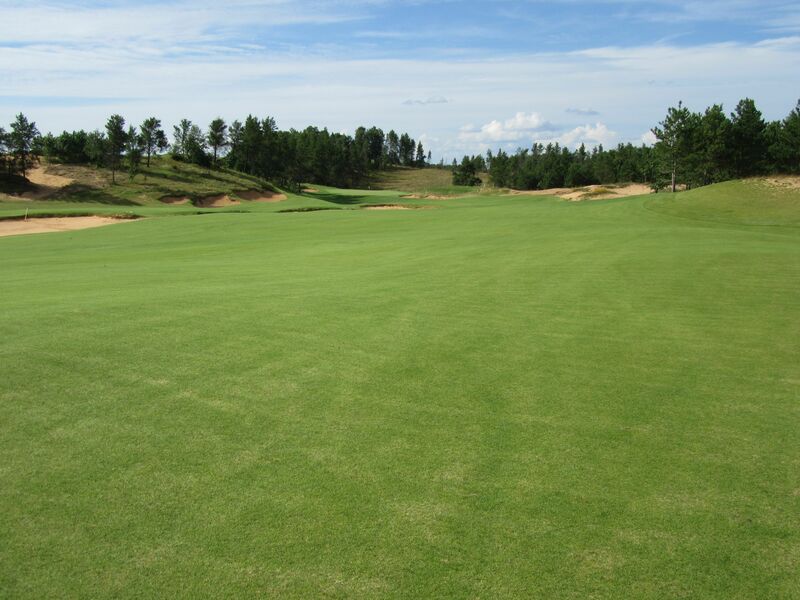 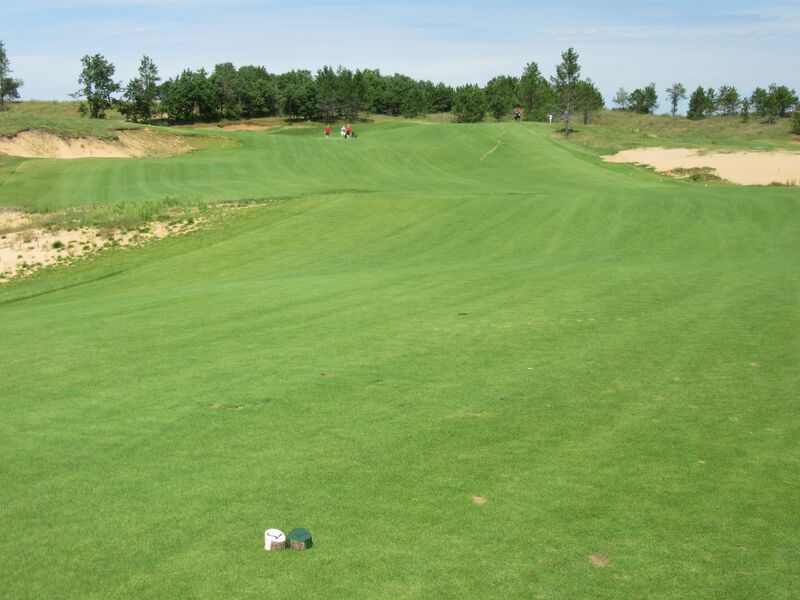 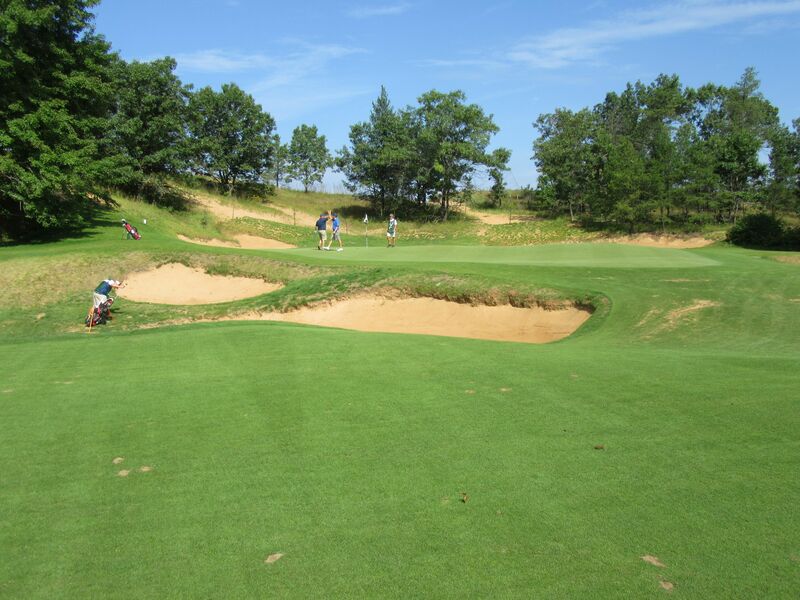 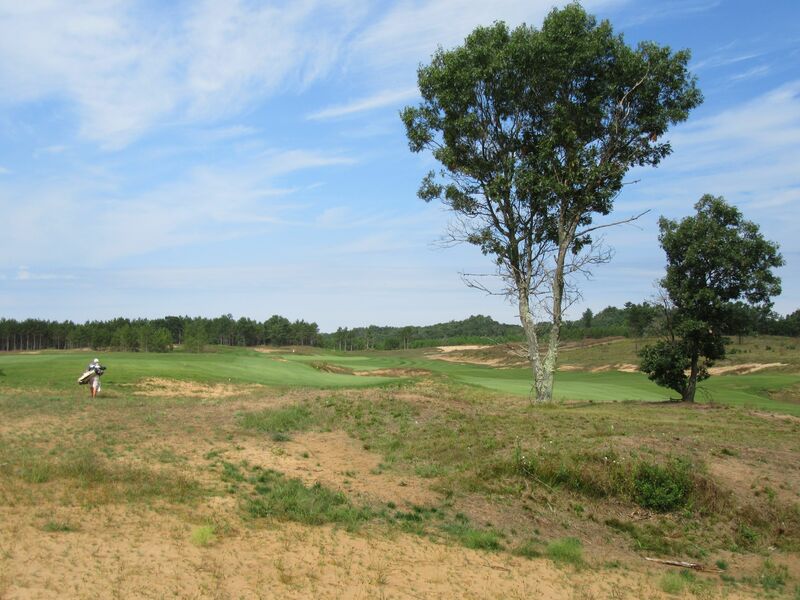 Wisconsin and Midwest golf enthusiasts are rightfully chomping at the bit to check out the country’s newest and most exciting golf resort, and early reviews say the future should be quite bright in Rome, Wisconsin.